Microservices are more than just a passing fad. Not just an extension of Service Oriented Architecture and more than just smaller surface areas for service deployments, Microservices combine the best ideas of Agile software, DevOps, and Reactive Systems. Teams which adopt the Microservice philosophy find that they end up deploying their software more frequently and are able to satisfy the needs of their business more consistently. Despite this growing complexity of operational management, the march of business spurs innovation; yielding new tools, practices, and services to support the lifecycle of Microservices and the benefits they promise. 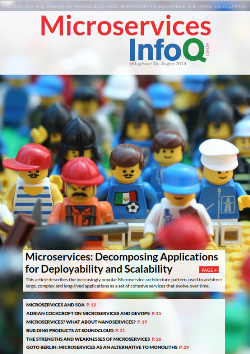 Within this eMag, we have chosen articles which highlight the pros and cons of Microservices, we offer insights from industry leaders, and hopefully we spark a few ideas for our readers so that they may leverage Microservices within their own domain. Microservices: Decomposing Applications for Deployability and Scalability - This article describes the increasingly popular Microservice architecture pattern, used to architect large, complex and long-lived applications as a set of cohesive services that evolve over time. Microservices and SOA - Over the past year or so we've started to hear about Microservices as potentially new architectural style. Recently Thoughtworks' Martin Fowler and James Lewis wrote an article defining Microservices. However, Steve Jones takes issue with the general theme and much in that article, believing that there is little new here and this is just a Service Oriented Deliver approach. Adrian Cockcroft on Microservices and DevOps - Adrian Cockcroft discusses agility, implementing DevOps, the differences between Microservices and conventional SOA, and the strengths of weaknesses of microservice architecture. Microservices? What about Nanoservices? - Arnon Rotem-Gal-Oz has written an article following on from other discussions around the term Microservices and whether and how it relates to SOA. According to Arnon, this could be a slippery slope towards the Nonoservices anti-pattern, especially as some people define a Microservice in terms of lines of code. Building Products at SoundCloud – SoundCloud recently began the journey from monolithic services to a microservices architecture. While the road wasn't easy, Soundcloud found that the ends may have justified the means. SoundCloud does us the favor of retelling their journey with its pitfalls and victories alike, sharing the gotchas and best practices from their migration. The Strengths and Weaknesses of Microservices - After implementing heavy and cumbersome SOA solutions for more than a decade, are microservices the solution the industry has been waiting for? Or, are microservices simpler than monolithic solutions? GOTO Berlin: Microservices as an Alternative to Monoliths - James Lewis talked at the GOTO Berlin Conference about an alternative to the traditional way of building systems where all functionality is put into one big application with one big database, instead using a pattern where entirely separate business capabilities, together with their own data, are kept separate in microservices.